Farmers have traditionally used plastic mulch to protect their crops from insects and disease, to promote faster growth, earlier crops and improve plant quality. Now, a new product has been developed that does all this, plus more, at a higher level than regular plastic mulch by itself. There are two primary type of row covers, "floating" and perforated row covers. Both will result in healthier, faster growing and earlier crops. This means increased profits for you, the farmer. Through our trial farm and experiences with farmers on an international level, we found that these products produces superior results when combined with regular plastic mulch. Here’s why: the row cover increases the soil and air temperatures, resulting in faster growing crops. 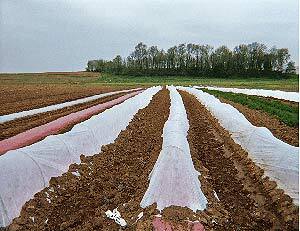 On our trial farm, row covers brought in crops four to ten days earlier than under regular plastic. At night, row covers slow the rate of heat loss. Stored heat radiates from the soil and is partially held under the row cover, increasing temperature by as much as 4° Fahrenheit. We found it protects crops down to 30° Fahrenheit. The row cover minimizes overall temperature fluctuation, therefore reducing plant stress. The row covers are lightweight yet strong. They protect crops from birds and insects, such as the whitefly. They also protect crops from frost and disease. The row covers are UV-stabilized, and provide the correct moisture and light levels for optimum growth. The row covers come in a variety of sizes, ranging from 6’ x 250’ to 50’ x 1000’. The wide row covers are designed for installation over large areas with minimum labor. A full acre can be covered in as little as two man hours. USED WITH WIRE HOOPS TO CREATE TUNNELS AND A MINI GREENHOUSE EFFECT. THIS SYSTEM CAN HELP PLANTS GROW FASTER TO PRODUCE EARLIER HARVEST. THE CLEAR IS USED FOR MAXIMUM HEAT WHILE THE WHITE IS A LITTLE COOLER.